Squad 21, the first Squad fire apparatus in Darien's history, was placed into full service Aug 18, 2018. 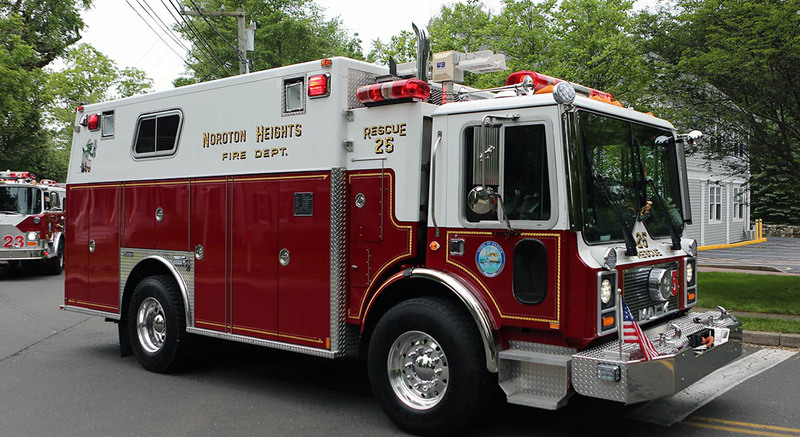 It was custom-designed by Noroton Heights FD and generously funded by the Town of Darien. 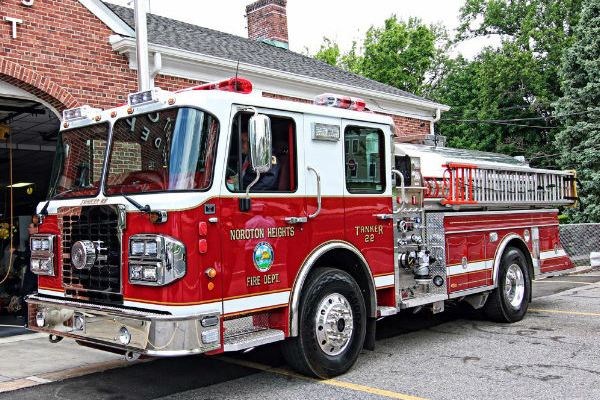 It is a Marion body pumper with Spartan Metro Star chassis, and has a 450HP L9 Cummins diesel engine, Allison 3000 EVS transmission, 1,500 GPM CSU Waterous pump, remote-controlled 17ft Nightscan vertical mast light tower, and electric remote-controlled deck gun. The Squad features a 775 gallon rectangular UPF poly III water tank, electric TFT monsoon deck gun, 1,500ft of 5" hose, 600ft of 2 1/2" hose, multiple 1 3/4" attack lines in the crosslays, a full suite of TNT Rescue hydraulic rescue tools both high pressure and cordless electric, a full complement of Milwaukee cordless tools, roof/vent saws, hazmat tools, hand tools, and SCBA. Tanker 22 is a 2015 model Spartan Metrostar/U.S. Tanker with a 1,250 gpm pump, 2,000 gallon tank and a 2,500 gallon portable tank. The three air-operated dump chutes in the rear can be operated from the cab or exterior. There are two 3″ ball valves for filling from the rear of the truck, two 10' hard suction lines, and a roof ladder. The apparatus carries a full complement of SCBA packs, portable radios, hand lights, irons, roof hooks, various hydrant and hose adapters, and Speedy Dry. 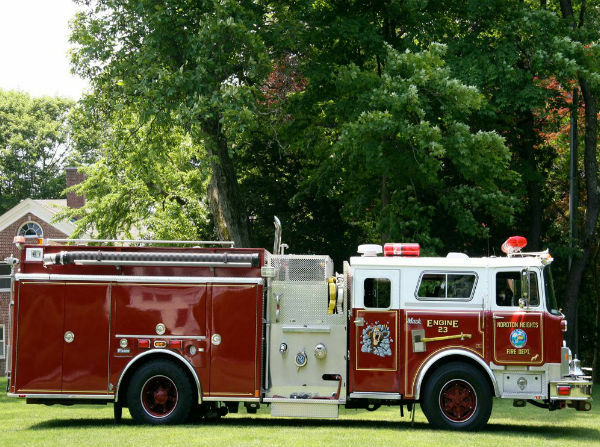 Ladder truck 20 is a 1988 model Mack CF 688FC Quint with an all-aluminum body. 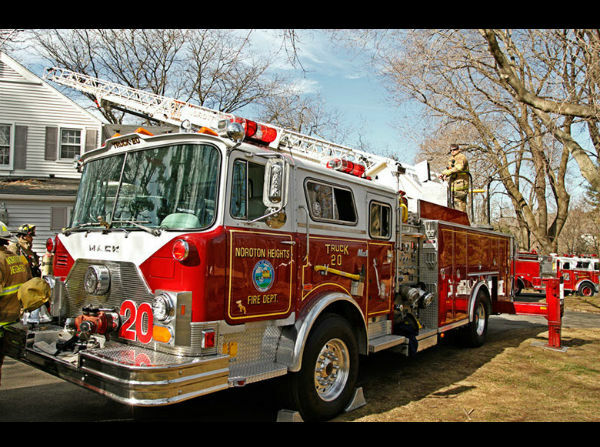 Originally operated as Engine 20, a 750 gallon pumper, Noroton Heights stretched the frame, added a heavy rear axle, and added the aerial ladder. The truck now carries 500 gallons of water and 1,000' of 5" hose. The truck is a first-due apparatus on structural calls. The truck features a 1,500 GPM Waterous Pump, 500 gallon UPF Poly-tank, 1,000' of 5" hose, a 75' three-section R.K. Aerials ladder with a pre-piped waterway. The apparatus also carries 139' total feet of ground ladders and a portable monitor with 4" blitz line for quick knock-downs. 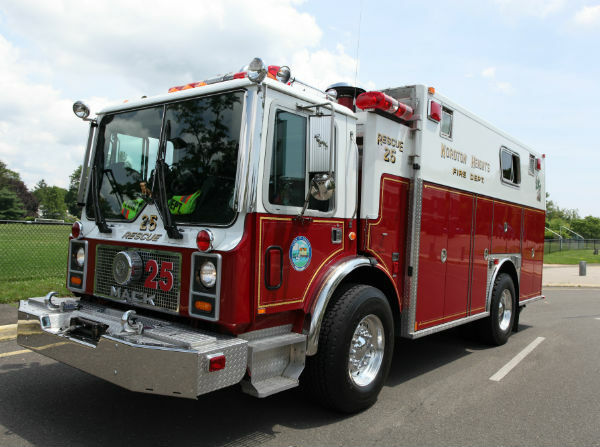 The engine is a 1989 Mack CF Pumper Rescue with a 2006 Marion built body. The apparatus was procured from the FDNY in 2005 following work at ground zero and the FDNY Fire Academy on Randall’s Island. A piece of the 9/11 steel is mounted on a plaque inside the jumpseat area, honoring the lives of the fallen and the many served by this apparatus. The apparatus features a 1,500 GPM pump, 600 gallon tank, 1,700' of 5" hose, 10 KW diesel generator, and Hurst spreaders/cutters/rams pre-connected with a simultaneous pump. The rescue is a 1989 Mack Rescue model with a Marion Rescue walk-in style body. 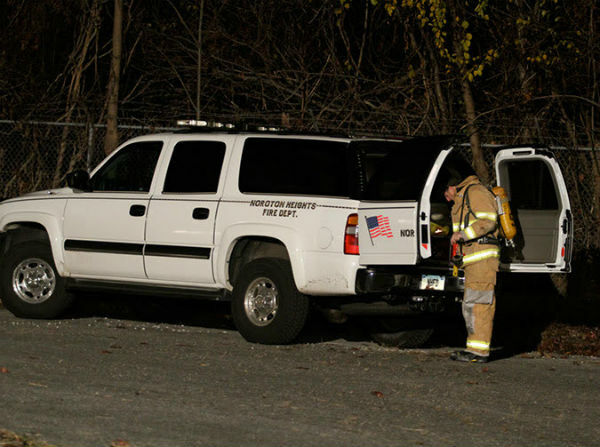 The truck is outfitted for heavy rescue, hazmat, mass casualty, and cold water rescue. The apparatus features a 20 KW PTO generator; light tower; command post; weather station; hazmat suits; cold water rescue suits; man in machine kit; Res-Q-Jacks; multiple Paratech airbags, struts and extensions; cribbing; backboards and stokes basket; multiple SCBA equipment; RIT bag; spare SCBA cylinders; MVA toolkit; impact tools; air tools; plasma cutter; and a variety of reciprocating saws. Our brush truck is a 2017 Polaris Ranger 1000, ideal for work in deep brush, heavily wooded areas, confined spaces and at crowded events. The Polaris features a fully enclosed, heated cab outfitted with a dispatch radio, iPad dock, warning lights, scene lighting, fold-forward windshield with wipers, and a winch on front bumper. The custom-fabricated bed holds a 70 gallon water skid with 5 gallon foam cell, 100’ of 3/4” hose reel and a stokes basket. The bed also carries 200’ of 1” hose dead pack, shovels, iron rakes and a chainsaw. Unit 200 is a 2013 Chevy Tahoe and driven by the department Chief. The vehicle is one of our first response vehicles and often first on scene. 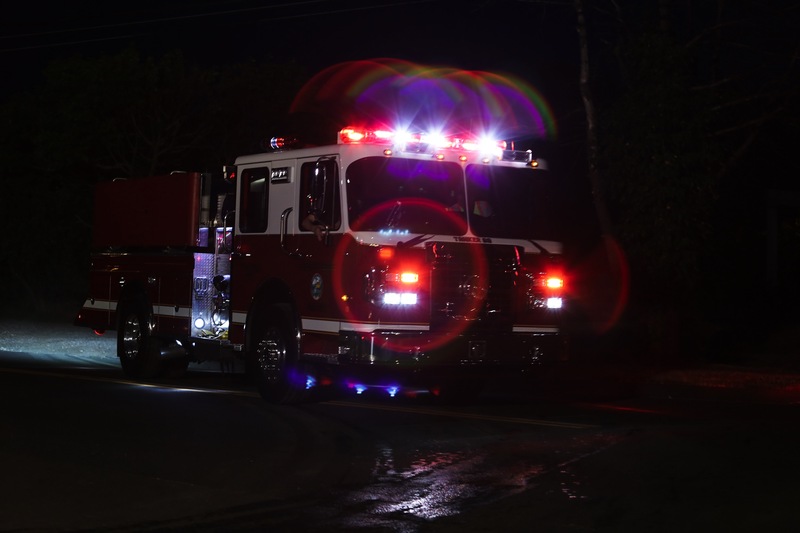 The vehicles carries a first-response complement of equipment including a full set of turnout gear, SCBA, fire extinguishers, hand tools, lights and other tools. It is outfitted with an iPad and a custom-built console with radios for dispatch, fire, police, EMS, and neighboring cities/towns. The rear cargo area has a metal divider and features a pull-out, locking storage drawers. 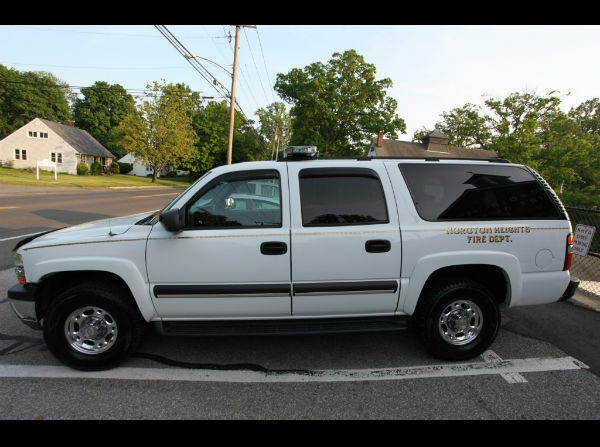 A former Chief's vehcile, our 2003 Chevrolet Suburban is usually driven by an Assistant Chief or Officer as a first response vehicle. 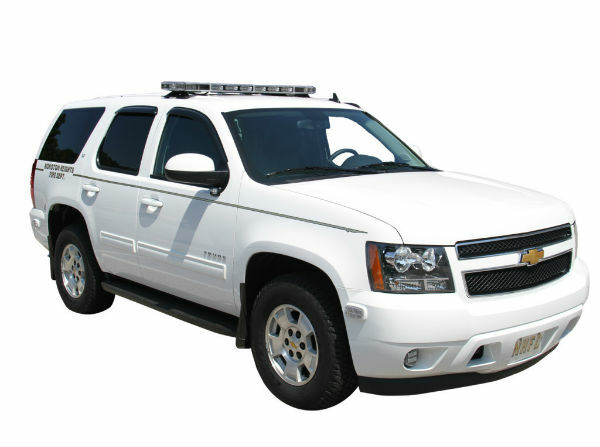 The Suburban carries a first-response complement of equipment including fire extinguisher, hand tools, lights and other tools. It is outfitted with radios for dispatch, fire, police, EMS, and neighboring cities/towns. 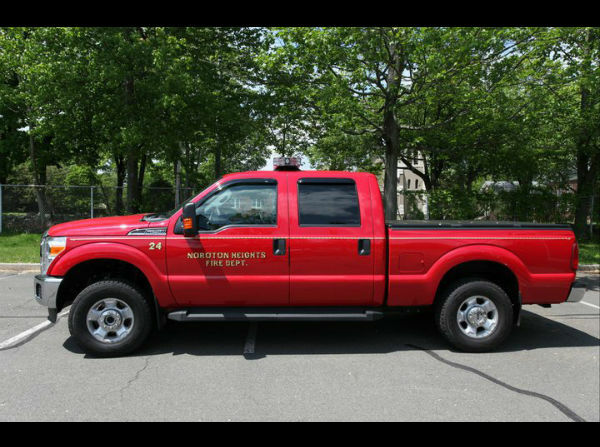 Our 2011 Ford F-250 Utility Truck is usually driven by an Assistant Chief or Officer as a first response vehicle. 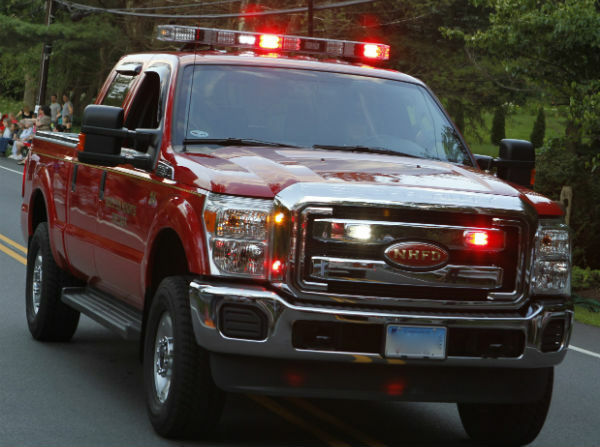 The F-250 truck has integrated emergency lighting and radios for dispatch, fire, police, EMS, and neighboring cities/towns. We are often asked how we've strategically allocated our budget to build and maintain our fleet of apparatus. There are no easy answers. 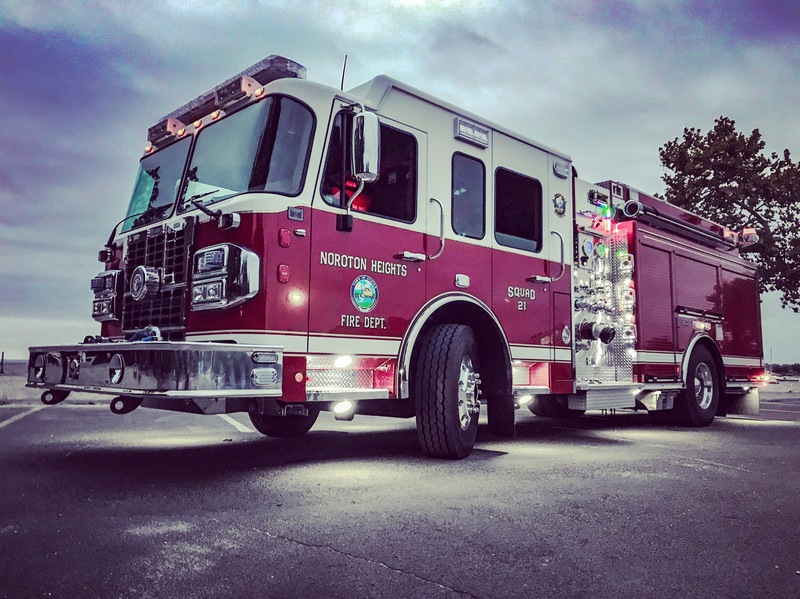 Since our inception, Noroton Heights FD has included among its ranks a mix of career firefighters, workmen, tradesmen, financial analysts, and CEO's - much like the makeup of the town where many of us live and all of us serve. Each member has generously donated their time and experience, outside of being a fire fighter, to contribute their expertise into obtaining excellent trucks, equiping them with cutting-edge tools in the fire service, and maintaining our fleet such that all trucks remain "in service" and ready for work 24/7. Who pays for new apparatus? 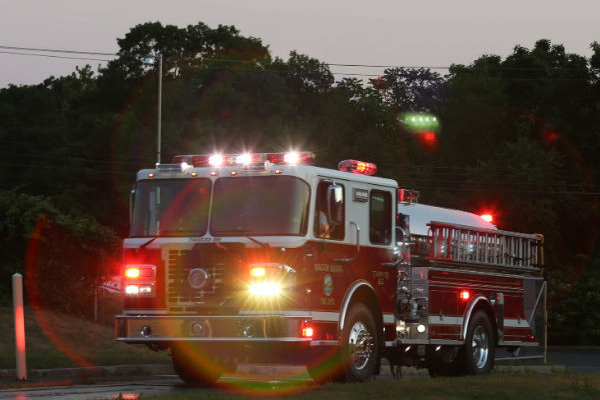 The Town of Darien generously provides funds to meet the apparatus needs of the Town's fire departments. When time comes on our upgrade schedule, the town funds the accounts needed to pay for the required apparatus and/or upgrades. How many calls a year do you respond to? Do I have to live in town to join? 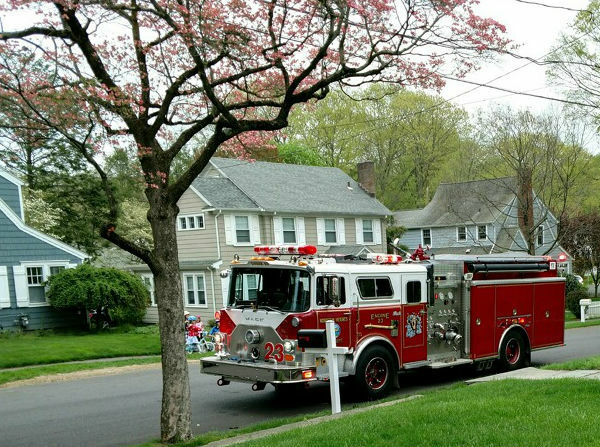 No, for a line (fire fighter) position, you must live in a neighboring city or town immediately adjacent to Darien, and be within 5 miles of the station. Alternatively, if you are employed by the Town of Darien, you meet the membership requirement. Are there any non-fire fighter positions in the department? Yes, there are multiple non-fire fighting positions (called "non-line") for people who wish to join the department and support us in a variety of ways, from meeting secretary, to financial secretary, treasurer, record keeping, and more. Contact us to explore finding your place in our firehouse. How do I schedule a tour of the fire house? Contact us via our contact page here or stop by the fire station any Sunday morning from 10am-12pm. Are members assigned to specific apparatus? Generally - no. Every year when Lieutenants are elected, each is assigned a single apparatus. Their job is to maintain and oversee the life of that apparatus during their tenure. Above the Lieutenants, a single Captain is elected, whose job includes overseeing all the Lieutenants and making sure all apparatus remain in-service and ready for a call 24/7. Members are trained on every apparatus, and must memorize the use for and location of every piece of equipment we carry - on every apparatus. When members respond to a call, they ride the first piece of apparatus departing at the time. Many members choose, but are not required, to take advanced classes educating them in specific areas of focus. For example, in 2017 some members took a course and were subsequently certified on Advanced Extrication; they have become the go-to experts on many of our rescue tools. Similar certifications are held by our membership across a variety of specialty areas, ensuring that from the most mundane to technically challenging calls, we have well-trained members on hand. Do you ever move tools from one truck to another? Rarely, but if there is a specific need, we will. For example, when Engine 21 was retired we moved many of the tools to other trucks, instead of putting them in storage. This way, we enhance the capabilities of our fleet and maximize the life of the tools. In most cases, a tool is purchased for a specific need served by a specific truck. If that tool proves so useful that it fits the needs of another truck, we will buy additional tools, rather than compromise our existing inventory by moving it truck-to-truck. School shootings have sadly become a regular fear, do you have a truck that can help in these situations? Yes. We have specifically prepared for exactly this scenario. We hope it never happens. But specific tools were aquired and members were trained to handle just such a "mass casualty" event, including tactical gear and body armor. We do not disclose the full array of tools we carry for this scenario as to not compromise our operational integrity were such a tragic event to occur. Critically important to our response here is our close coordination with our town's other two fire departments, Darien Police, and Post 53 EMS. All of whom we remain in close contact with on a day-to-day basis. Do you have "engineers" or "chauffers" that only drive the apparatus? No. All drivers (often called an Engineer or the Chauffer) are fully trained as both a fire fighter and an operator of the apparatus. While their job on a call may be to stay with the apparatus to operate its built-in functions (a pump, light tower, etc. ), they are always active fire fighters. Even on calls, our drivers are actively involved in fire/rescue operations. Do all members drive the apparatus? No. To be a driver you must get your Q Endorsement from the State of Connecticut, or hold a Commercial Driver's License. Further, you must be trained by the department and signed off by the Officers. Some trucks look old, does that mean they can't do as much as newer looking trucks? No. 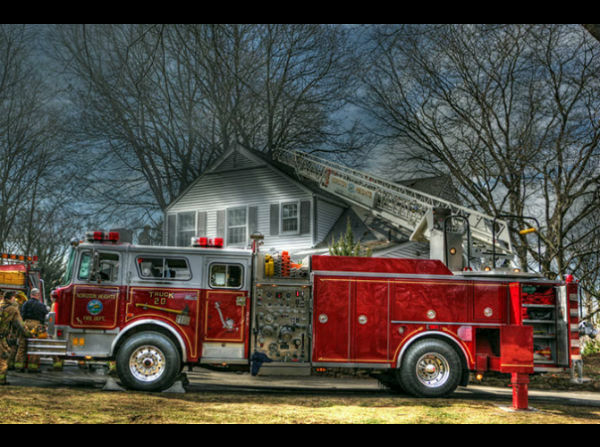 Every apparatus - in any department - is only as good as the tools it carries, the members' training, and the functions of the apparatus. While some newer-looking apparatus may have a different water pump or different looking comparents on the sides, the tools we carry and the features we've built onto our trucks (such as the pump, light tower, and storage areas) are often the same-spec, and in many cases better, than what many fire apparatus are capable of offering. For this reason, we maintain a careful balance in our budget between buying a new truck, upgrading an older truck, and buying new tools. The goal is always the same: how to best offer fire protection and rescue service to our Town, getting the highest quality and best return for the money we have available to invest.